The Storm Prediction Center continues to outline extreme northeastern Colorado for potential severe weather Wednesday. This threat is slight, but is the first of the season for the state. The most likely risk will be damaging hail, but there is potential for spot-fires from lightning and and damaging wind as well. The rest of north central Colorado could have thunderstorms, but the likelihood of anything damaging is far less likely. You can clearly see the comma shape to the slight risk area for Wednesday. This is classic for the time of year when mid-level storm systems sweep through. The track of the system may be similar to last week's, but the speed will be much faster. Plus, there is not the same amount of energy -- this one has far less. With that said, the timing is just right so that the system will spread some stronger storms (again, potentially damaging) over the northeastern plains later in the day and early evening Wednesday. This is as the low pressure area drifts over that corner of the state. As soon as night falls the severe weather threat drops quickly and we will have the "wrap-around" showers on the backside of the system for the state. This isn't necessarily early for severe storms in Colorado. 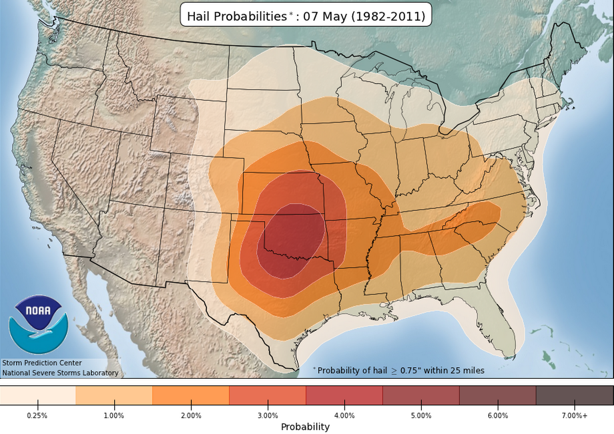 Climatologically, May 7th shows Colorado in a zone for at least a small chance for damaging hail. Colorado and Wyoming are the country's "hail capitals" of the country, but that's typically in the middle summer. As Colorado's weather tames to showers, the severe threat moves east for early Thursday. The outlook looks to cover a wide area, but I'd look out for the areas to the north (near the lowest pressure area) and from Wichita, KS south into Texas (along the dryline). That dryline may be the best area for tornado development Thursday. Meanwhile, back at home the rain showers continue early Thursday. Some areas will do well with rain; over 1" possible in a few areas of north-central to northeast Colorado. I think most of the greater metro will have less than that 1" of rain from this system. Unlike last week's system, the prolonged rain chance with damaging wind won't develop with this system. Outside of Wednesday night and Thursday morning, the weather calms some as soon as Friday and Saturday. We'll be watching another "battle of the models" in the handling of Sunday/Monday's storm, for now there is a huge amount of disagreement on how the pattern sets up from Saturday on.